Kauai has been named by National Geographic as one of the top destinations to visit this year and we at Koloa Landing® Resort know why. Kauai offers everything you would expect from a Hawaiian island paradise and more. Stunning vistas, the Na Pali Coast sea cliffs, numerous cascading waterfalls and amenities like no other. It’s all waiting for you at Koloa Landing® Resort. Koloa Landing® Resort sits on the southern tip of Kauai, Hawaii, amid 25 acres of lush tropical landscape. 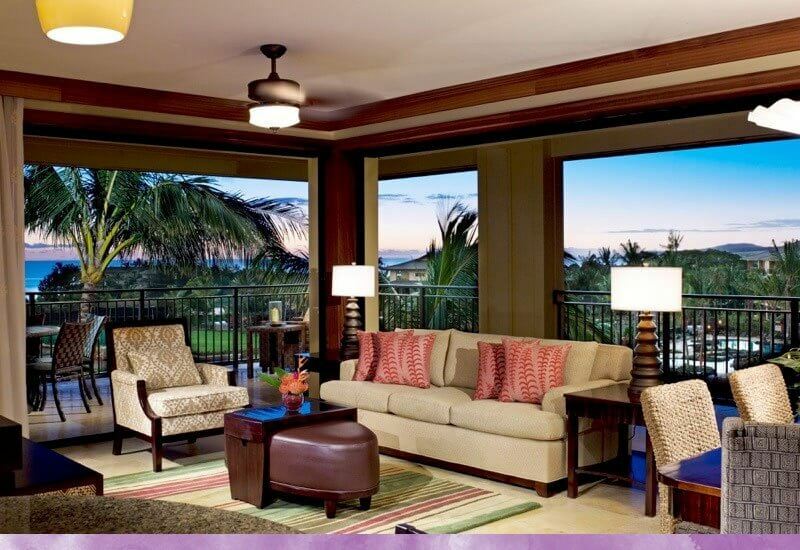 We offer the largest, most luxurious villas in Kauai. From deluxe studios (473 square feet) to four Bedroom Villas (3,665 square feet), we can meet your every need with our top class service. All of our incredibly appointed suites feature generous lanais (Hawaiian for veranda or porch), gourmet style kitchens, and stunning furnishings and accouterments that promise an unforgettable experience of luxury and grace. Koloa Land ing Resort is a mere five-minute stroll away from the wonderful shops of Kukui’ula Village. The village is filled with fine dining establishments and laid back eateries offering hand crafted ice cream and the freshest sushi. If fashion is your thing, check out the latest in the village too. Gift shops, art galleries, and a farmers market make Kukui’ula a gem on the south shore. If you are staying in, be sure to take advantage of the Gourmet Marketplace in our lobby. You can stock your villa with made-to-order specialties, and any other groceries and drinks you can think of. It’s the versatility and classy appointments in our suites that make them special. Every suite comes with a private bathroom for every bedroom high-speed internet access and LCD tvs with cable. Whether it’s receiving a relaxing couple’s massage at our on-site spa, The Spa at Koloa, or entertaining guests in our 12,000 square foot meeting facility, we have the space that is perfect for you. You may never want to leave Koloa Landing® Resort – but it would be a shame not to. Kauai is filled with pristine beaches where you can rent all the beach stuff your heart desires. The Koloa Landing® Beach Club and concierge can help you plan surfing, swimming with sea turtles, helicopter rides and everything in between. Our staff is made up of friendly local Kauaians that know the island well and embody the Aloha spirit. Interested in learning more? Contact us today and book your trip to Koloa.